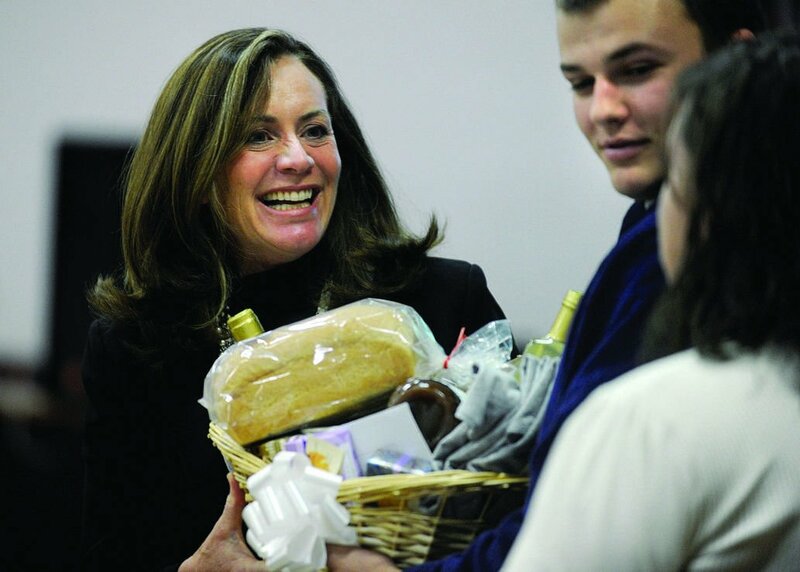 Dorothy McAuliffe receives a food basket from Eastern View student Corey Twomey and teacher Katie Reames. 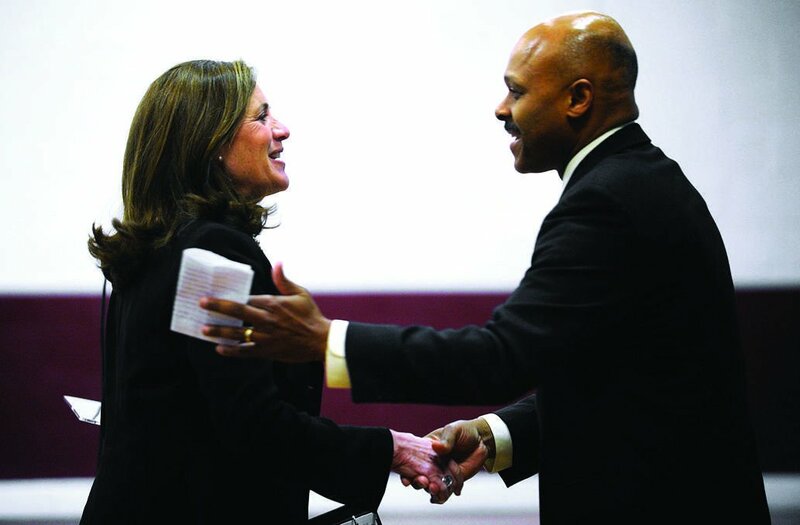 Virginia first lady Dorothy McAuliffe and Maurice Jones, state secretary of commerce, attended the event. That dream, the brainchild of Virginia Cooperative Extension agent Carl Stafford, is to turn the former George Washington Carver Regional High School into a multi-use cannery/food processing facility and an agricultural research and education center. While the $63,000 grant from the Virginia Department of Housing and Community Development is a mere drop in the bucket for a project estimated at $25 million, it is a step in the right direction toward renovating a nearly 70-year-old facility. Actually, it is not the beginning. More than four years ago, Stafford and others came up with the idea of turning the former black high school into a useful part of regional agriculture. They formed a nonprofit organization, The George Washington Carver Agriculture Research Center, got the Culpeper County Board of Supervisors’ blessing to use the facility and set about coming up with a viable plan. The group has already partnered with the Extension Service, the Virginia Food Enterprise Centers, the Rappahannock–Rapidan Regional Commission (which has pledged $15,000 of in-kind services) and the George Washington Carver Alumni Association. It hopes to develop ties with Germanna Community College, Virginia State University and area high schools in the future. Experimental crop test plots were planted last summer (primarily to do herbicide research) on the 11-acre parcel of land almost exactly halfway between Culpeper and Orange on State Route 15. But Stafford and his group hope the first large-scale project will be the development of a modern commercial kitchen and cannery. “I know I’m being optimistic, but I’m hoping we’ll have a test kitchen open within a year,” said Janet Bearden, the founder of the Virginia Food Enterprise Center. Bearden gave area dignitaries, including McAuliffe and Virginia Secretary of Commerce and Trade Maurice Jones, a tour of the spacious room where she envisions farmers and gardeners turning blemished vegetables and fruit into usable food. “As you can see, we have space to grow,” she said, adding that she hopes one day to also be able to process beef, pork and poultry. Bearden said that a top-flight commercial kitchen would cost about $4.5 million. “We understand that a large portion of funding will likely have to come from the private sector,” Stafford said. He added that the facility’s location, surrounded by high-quality farmland and away from imminent residential development, is perfect for agricultural research and a cannery/food processing center. Jones, who spoke briefly, said he was in Culpeper to celebrate the “teamwork, local leadership and strategic planning” that had brought the project this far. “This is really impressive,” he added. George Washington Carver Regional High School opened in 1947 and served Culpeper, Madison, Orange and Rappahannock counties. It closed in 1969 and two years later became Piedmont Vocational School, which survived through the 1980s. Since then, a number of different vocational classes have been held at the facility. Most eventually moved to more urban settings, including Germanna Community College’s automobile technology school, which is now in Stafford. Much of the main school and its adjoining buildings have been vacant the past five years, with Culpeper County providing funds for maintenance and utilities. That upkeep is costing Culpeper County more than $50,000. The land, obtained from the Inskeep family 70 years ago, can be used only for educational or agricultural purposes, according to a clause in the original agreement.